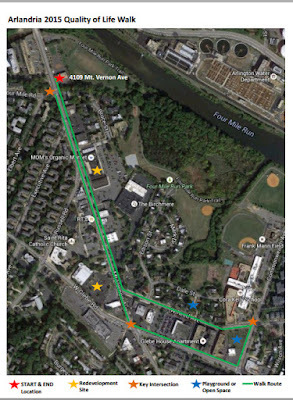 VDOT has announced a public information meeting scheduled for Tuesday, July 28 at Gunston Middle School, 2700 South Lang Street in Arlington from 6:30 to 8 p.m. This project includes maintenance and repair work for three bridges at the Glebe Road and I-395 Interchange in Arlington County. 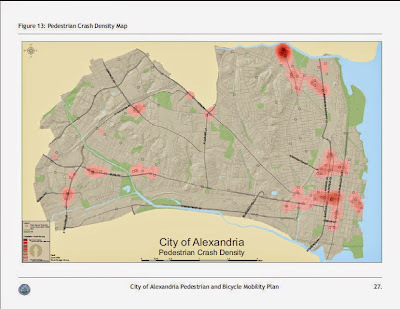 The work will include milling and overlaying bridge decks and approaches, reconstructing deck joints, concrete repairs, bearing replacement, beam painting, approach guardrail improvements and reconstructing selected sidewalk transitions. For those who might not yet have heard, there's still time to get in on the Arlandria Quality of Life Walk scheduled for Friday morning. The annual event, primarily for representatives of City departments to get together to collectively solve on-going issues, is set for Friday, July 24 at 9:00am. The walk will commence at the Four Mile Run Park Conservatory Center at 4109 Mt. Vernon Ave. Please feel welcome to invite others. All are invited to tour the Four Mile Run Wetland Restoration construction site on Friday as well. For those interested, the tour will begin after the Quality of Life Walk and will be facilitated by Dana Wedeles (Department of Recreation, Parks, and Cultural Activities) and the contractor. If you would like to participate in the Wetland tour, please wear appropriate shoes (any durable footwear that you do not mind getting muddy!). 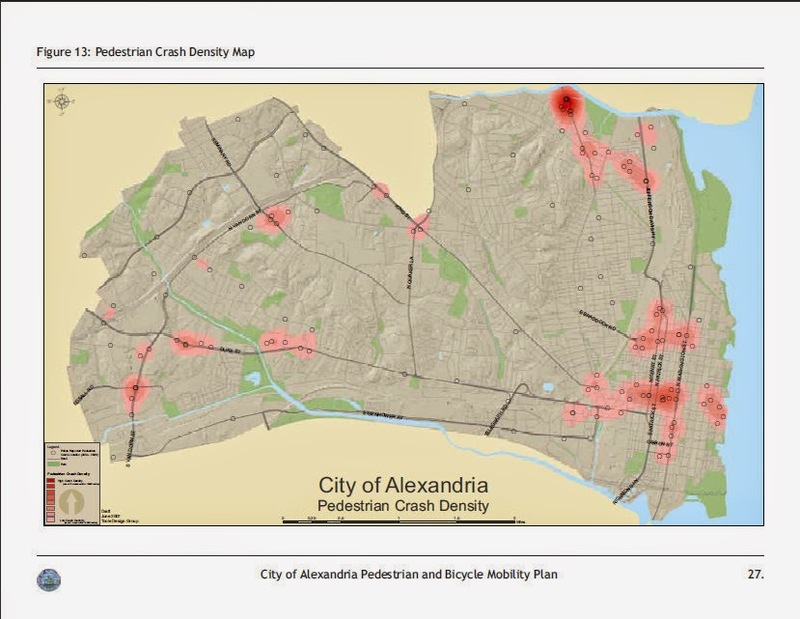 The City of Alexandria (“City”) issues this Request for Information (RFI) for the purpose of gauging the interest of for-profit and non-profit entities in forming potential public-private partnerships with the City in regards to two separate but complementary broadband initiatives. 1. The first is to form a City-initiated fiber backbone infrastructure to support data transport among the City’s public institutions, including its schools, libraries, public safety, and other City facilities (“Institutional Network,” or “I-Net”). The bid opening date is listed for September 3rd at 4pm. Already a leader in promoting healthy & foods to folks of all walks of life, 4MRMarket just expanded its groundbreaking program!! Sunday, the Four Mile Run Farmers & Artisans Market (4MRMarket) increased access to fruits and vegetables for the food insecure of Arlandria and the surrounding neighborhoods, while also benefitting small and mid-sized farmers in the region. 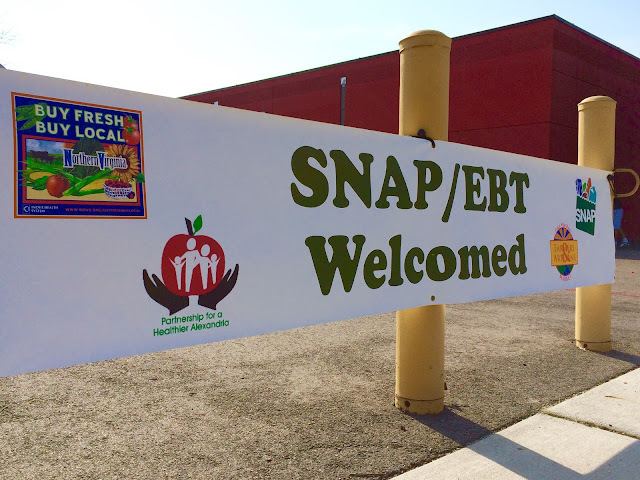 The new incentive program was made possible by the USDA with $31.5 million granted through the Food Insecurity Nutrition Program (FINI). National nonprofit Wholesome Wave received a $3.77 million FINI grant, of which 4MRMarket, as a subgrantee, received $4,100. “It's been a lot of fun and a lot of hard work to build 4MRMarket over the past few years. We'd hope to continue to be much more but it's awesome to look back to 2010 and see how far we've come. Since then we helped bring about a lot of improvement to Four Mile Run Park through fund-raising and plain, old hard work, helped raise funds for a variety of other non-profits and helped folks of all walks of life,” says Nick Partee, Co-Market Manager and Founder. 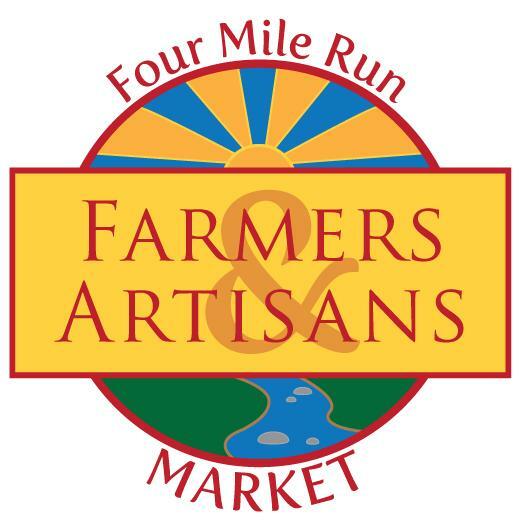 Since June 2010, the Four Mile Run Farmers & Artisans Market has been committed to bringing fresh, nutritious food to people of all income levels, provide an opportunity for local artisans and producers of goods to bring their wares to market, strive to reflect the diversity of the community, and improve the quality of life for Arlandria residents and visitors. With the grant, 4MRMarket increases affordable access to fresh fruits and vegetables for SNAP consumers in Arlandria, while also supporting local agriculture. “The Four Mile Run Farmers & Artisans Market was the first farmers market in Northern Virginia to enable SNAP beneficiaries to Buy Fresh, Buy Local and we are proud to have been able to assist others with technical assistance and to see the program grow throughout the region. We are more than excited to grow this program and provide these additional incentives!,” says Kevin Beekman, Co-Market Manager at 4MRMarket. 4MRMarket received this award as a subgrantee on a larger $3.77 million grant, which nonprofit, Wholesome Wave, obtained from the USDA to support their national network of nutrition incentive partners. 4MRMarket is one of 32 community-based organizations that will join Wholesome Wave in this Large-Scale FINI Project. Wholesome Wave’s network is a robust community of innovation and learning, linking incentive programs through uniform data collection and evaluation to support the expansion and adoption of incentives through policy. Wholesome Wave’s project is one of many that received support as part of the total $31.5 million granted by USDA in this cycle. “We are thrilled to be working with such a diverse and competent group of incentive operators across the nation. This network brings together organizations ranging from a flourishing farmers market group to a large scale nonprofit, capitalizing on the grassroots expertise of community leaders, while also building regional and national impact that allows us to enact the kind of large-scale policy change we see in legislation like FINI,” says Wholesome Wave founder and CEO, Michel Nischan. The Four Mile Summer Movie Festival continues TONIGHT!! 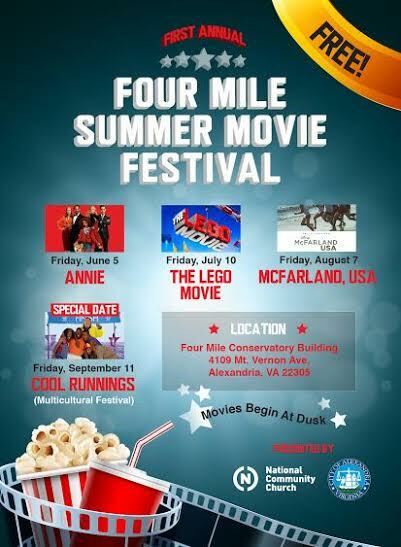 National Community Church – Potomac Yard is co-sponsoring a summer movie series with the City of Alexandria. The outdoor movies will take place at the Four Mile Run Park Plaza along Mount Vernon Avenue (adjacent to the Four Mile Run Conservatory Center). Look for the film to begin at dusk.